When the mission is critical, no one has time for complexities. 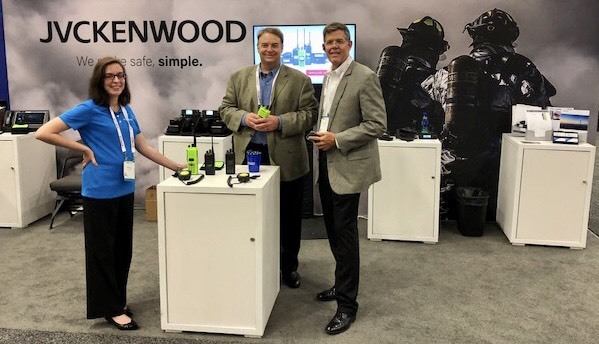 The KENWOOD Viking 6000 series portable is specifically designed for today’s public safety agencies with advanced features and ergonomics to meet the first responder’s mission critical needs. The Viking VP6000 is available in high-visibility housing and features flare grip design for enhanced control, large glove-friendly knobs, easily accessible emergency button, man down feature, and Viking FIRESafe® software option. Firefighters can simultaneously receive and display radio communications using up to four frequency bands so they never miss a call. The "select" and "unselect" speakers allow flexible audio control similar to a dispatch console. The VM7000 also features mixed protocol operation (P25 Phase 1 & Phase 2, SmartNet®/SmartZone®, and FM Analog), built in P25 GPS data, full featured control heads with large color displays and user selectable themes. In addition, the VM7000 fully integrates with the Pyramid Enhanced Vehicular Repeater Solution (EVRS). The EVRS extends all-band operation to portables in the field. Zetron’s MAX Fire Station Alerting solution is a purpose-built system designed to integrate with standard CAD systems delivered as a simple solution allowing dispatching from a central site. The system allows activation of the station alerting system to turn on lights, open doors, turn on fans, turn off a stove, connect to a PA for alert tones and dispatcher voice, and sense other inputs, such as monitoring station equipment and tire switches. Watch Senior Product Manager, Mark Cranmore, demonstrate MAX Fire Station Alerting here for additional information. Thank you to everyone who stopped by the JVCKENWOOD booth during the show. We enjoyed seeing many familiar faces and meeting new friends and we hope to see you all again in Atlanta, GA next year. For additional information on our KENWOOD Viking P25 radios or ATLAS P25 systems, contact our team here today.